A ‘Product Comparison’ gives the designer the opportunity to show that he/she has the analytical skill to consider a range of similar products. This is very different to general research when a designer collects a large range of images and simply adds a few notes about each product. A product comparison usually involves a limited number of products and also includes detailed notes. The notes are placed under headings and the same headings are used for each of the products. The musician below (the client) wants a new guitar for his performances and music sessions. He is not exactly sure what he wants and so the designer has helped him select three of his favourite designs. The musician and designer together compared each of the three designs using the same criteria. This helped them select the best one. The designer will design a new guitar based on the selected guitar. 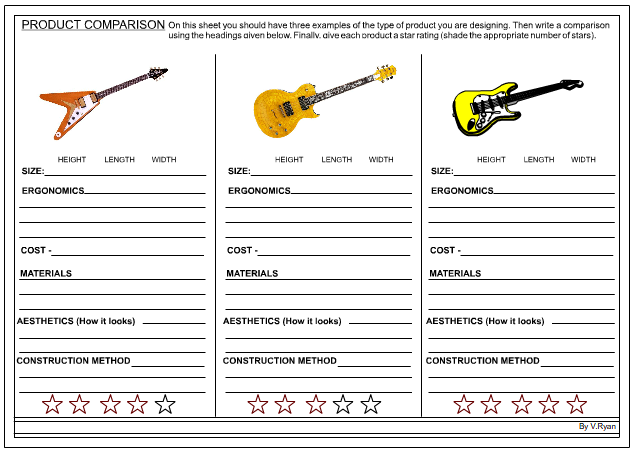 This selection and comparison process helps the designer design a guitar that the client will be pleased with. Ergonomics is an important part of research. Whatever you design it must fit the person who is to use it. For example, the guitar must feel comfortable in the hands and be balanced. The guitar must not weigh too much as this will make it uncomfortable to use for a long time. This has two aspects; the cost of manufacture and the price the product is sold to the customer. The method of manufacture often determines the price. A hand made one off item usually costs much more than a mass produced item. The costs of the guitars are compared and the clients preferred cost taken into account. This is rather subjective. The client is asked which guitar he prefers on looks and style alone. Which guitar appeals to you? Which do you think it is stylish, plain, traditional? The method of construction of each guitar varies. This is normally due to the materials used. For instance, a guitar manufactured from traditional materials such as mahogany is likely to be constructed in a traditional way using traditional joints, glues and fixings. A guitar manufactured from High Density Polyethylene (HDPE) is likely to constructed using modern technology such as injection moulding. The client may have a preference - he may like modern or traditional styles. The method of construction will probably affect the sound produced by a guitar. Are their any safety issues relating to the guitars? For example, sharp edges, weight or is the design a potential danger in other ways. Electric guitars need to be electrically tested before used. Compare each guitar on grounds of safety. What does the client think of the colour scheme? This is subjective and sometimes has cultural roots. For example, in China, colours are characterised by their lightness or darkness. White is regarding as a pure colour and reflects honesty. Red is associated with good luck and a child can expect to be given a red envelope full of money on his / her birthday. Elsewhere in the world red is used to represent danger. For this reason red is often used on road signs and other danger signs. The client will have his / her opinion on the colour scheme of the guitar that is to be designed and manufactured. Has the product been manufactured in an environmentally friendly way. Is it constructed from sustainable materials? For example, woods from sustainable forests. Have recycled materials and components been used? Does the product have a small carbon footprint? The client may be determined to have a guitar that is as environmentally friendly as possible. For example he/she may be happy to use recycled materials and components. Product Designers design for clients/customers. A product comparison is one way of finding out what the customer really wants. Ask the client to compare similar products. If the client is not happy with the final product he/she may not pay for the product and may be rather upset! Your reputation as a designer will be damaged. A sample comparison sheet is shown below. It shows three guitars shown by a designer and client. Comments will be entered underneath each of the headings for each guitar and finally a star rating is given.